On approaching this holiday home, you will start to get the feeling that you are an aristocrat on your way up to your castle. The cast iron gate that you pass, the drive, the former stables on your left everything gives the impression of arriving at a country estate. So what exactly can you expect to find here? It might not be a castle exactly, but you can look forward to a delightful stay in a lovely holiday home. Part of this home can also be booked separately as BE-6690-71. The other part recently underwent a complete renovation and together they form this beautiful group accommodation. Since it consists of two parts that are fully self-sufficient, each with its own entrance, it is ideal for groups who desire a little privacy among themselves. The lovely ambience continues outside, with a covered terrace. You can eat all your meals al fresco here, while enjoying a view of the fields. The rural setting is further highlighted by the neighbouring animals, who will be as interested in you as you are in them. 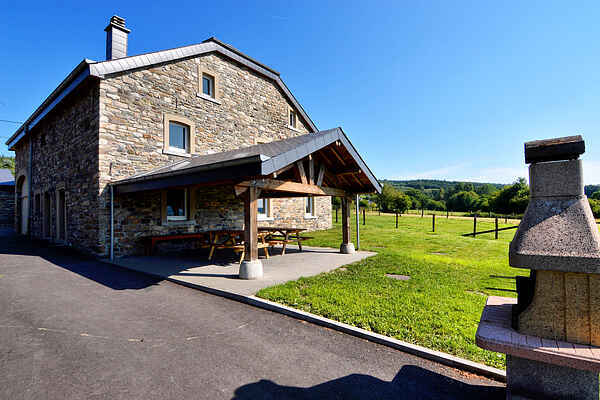 The home is located in a hamlet close to Vielsalm, in the heart of the Ardennes. The area's natural beauty and cultural attractions are within easy reach and can be explored on walks or drives.